Today I was about to login to Second Life to look after my art friend JadeYu Fhang as she had to suffer yesterday on ‘GRIPPE’, as influenza is called in French. She had fever but the exhibition in RIFT HORIZON opened and the artist was present – thank you JadeYu! The performance of the ‘walking skull’ was postponed of course, so JadeYu could head to bed again fast. Get well soon JadeYu! I know JadeYu Fhang is often in SL working on preparing art installations on her land. There, at Song Bird, I met her before she transferred her famous artwork ‘Roots and war’ to opengrid Metropolis at RIFT HORIZON. But I could not log in! 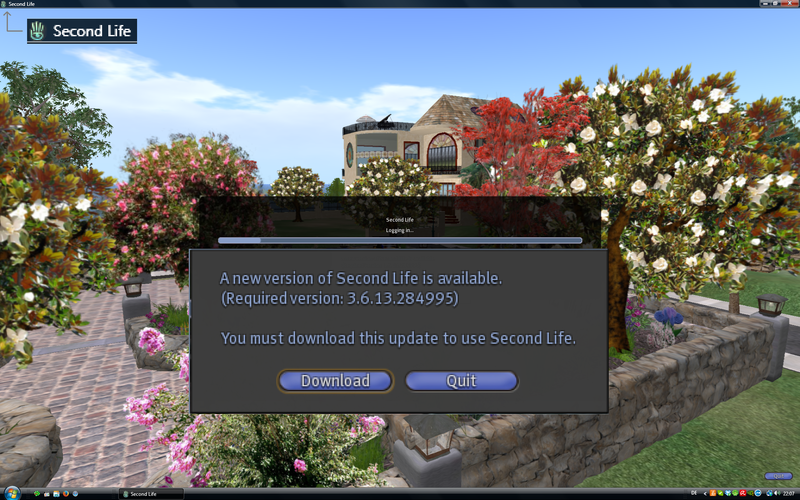 My good old prim based viewer that served me well for many years shouted back to me: “You must download this update to use Second Life”. You may have heard of the system Second Life where you walk in a 3D world with a digital virtualization of your so called yourself, named ‘Avatar’. I decided to Google on what the new update will bring me in ‘BBIWY’ matters. So I said: “is second life watched by nsa” and got a full hit back. This is the 1st ranked Goggle hit: “… according to Snowden documents, the U.S. has conducted spy operations in Second Life …”. The 2nd ranked Google hit brings a headline by ‘The Sydney Morning Herald’: NSA spies infiltrate World of Warcraft, Second Life online games (December 10, 2013). Now I have proof of a prediction I published in 2011: ‘viewer software will enforce that you have to accept whatever the software developers want to do with you – or you are dead’. My Avatar may rest in peace. Sorry JadeYu Fhang. I have to wait in opengrid for your return and stay out of SL – no Second Life for me this way! Hm … hm …. I cant give up to meet my old art friends. What to do? Luckily my birthday will be very soon. Shall I rent a PC in Romania or Ukraine and let my data run hosted there? I have an offer for 80 Euro a month – a highspeed noname rack manufactured by some Anonymous. That’s much money there in such countries. Who wants to travel with me? I need a sponsor! 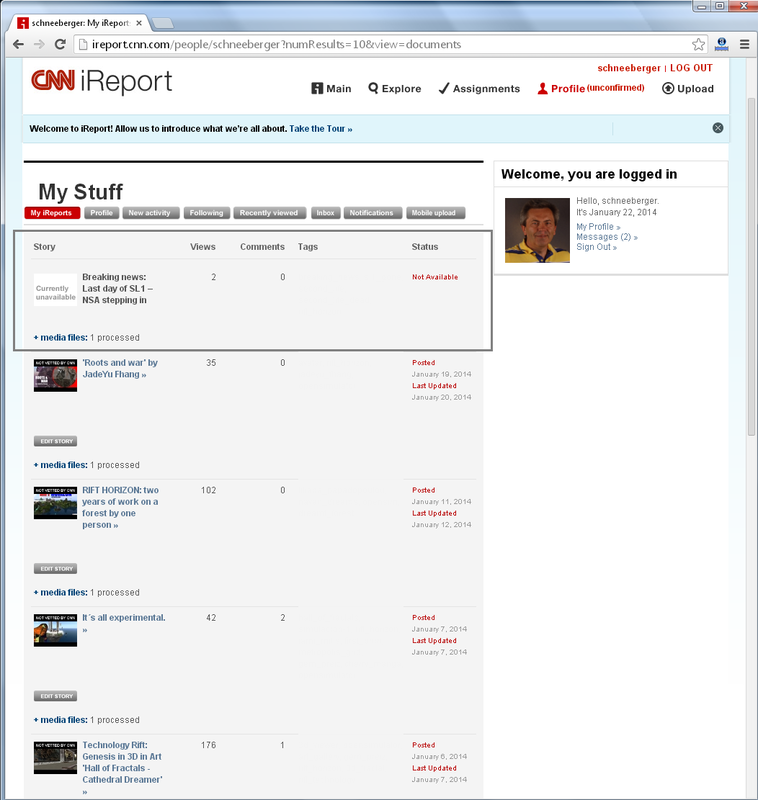 Just click on the picture to enlarge and you see: Story currently not available. Even not to edit! And the best for you, comes here: Enter after you clicked the link http://is.gd/icnnblocked now http://is.gd/icnnblocked- and you see the stat data the same way as I see it. 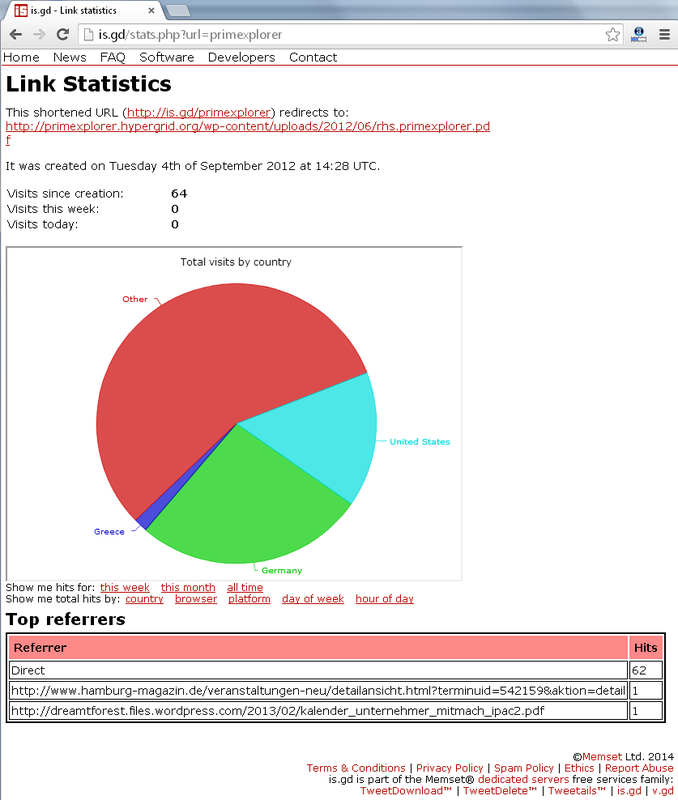 It is just the tiny ‘–‘ you have to add at the shortlink to get the stats. Only one click per IP address will be counted, so no double click will generate stats! Not sure what this is all about? New viewers are made do help NSA and CIA? Or is this just a piece of situationist “ART”? New Second Life viewers are not made to help NSA. All SL viewers have to be made the way authorities accept their use. Philip Rosedale had to pass a congress hearing to underline that the authorities have full access on the SL database. It is not only about Linden Dollar transfers, the virtuel currency. Use Imprudence and you see. They inform you before you connect to Second Life what data will be collected ‘by them’ on behalf of Linden Lab and transfered to LL in 5 minute steps even when you are in a gallery looking on artworks. When you have a smartphone they check where you are before you get the data you Google for. Nowadays such systems are stupid and you can even test it out when you set ‘positioning services’ in your iphone off and you Google for some ‘critical words’ by using Siri.